This is before setting the oars straight. These two pictures are right before I plugged the Arduino in the computer to make it move forward. 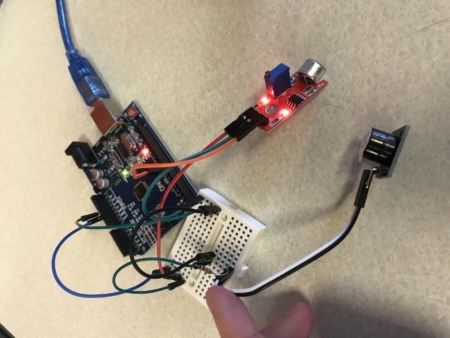 For this week’s lab, I got a chance to work with Arduino for the first time! At first, Duncan came up with coding stuff and I was honestly quite scared at the moment since I’m not that equipped with coding knowledge. 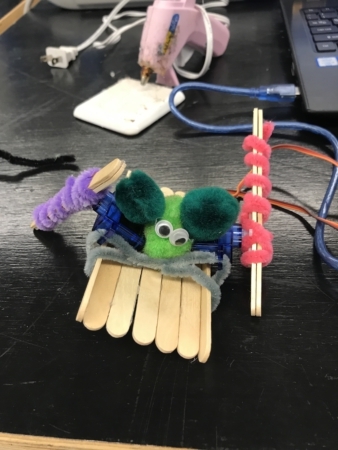 However, Arduino was really approachable and accessible technology with minimal coding knowledge required. 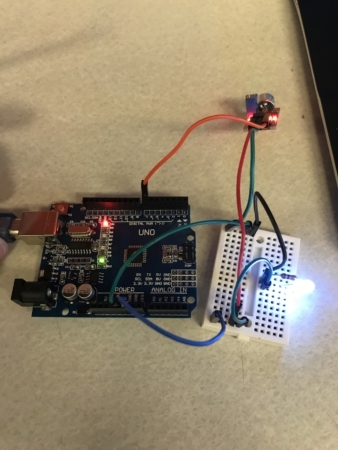 I first played with Arduino with led light and touch sensor during class time. 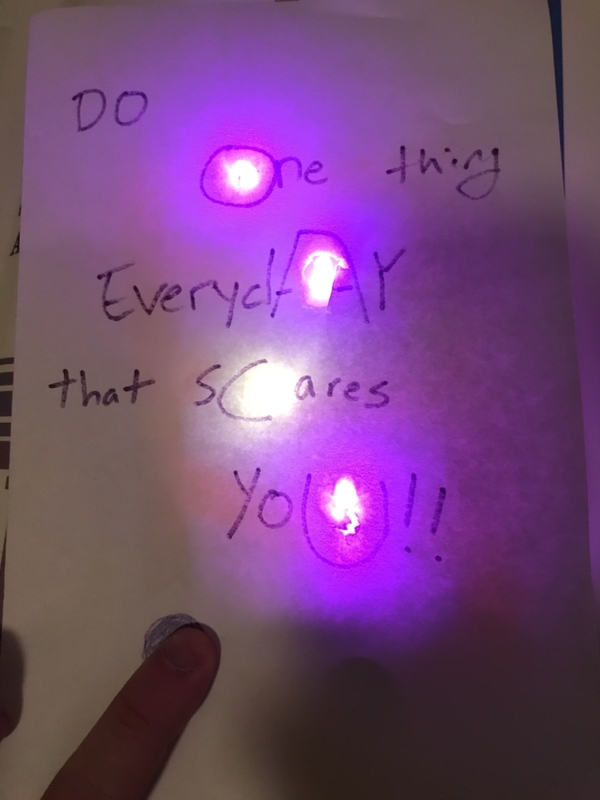 By using if statement, I could control how the led lights’ brightness with how much of contact I’m making. The coding process was very easy since I built off from the sample code. For my assignment, I decided to use the Arduino with alarm and sound sensor. Since most of my friends hang out in my house, I’m always very cautious about how loud we are during the night. With the Arduino, I’m going to create a machine which takes in how loud the surrounding is and alert us with the alarm when the decibel is too high. Below is the storyboard I have created for this project. 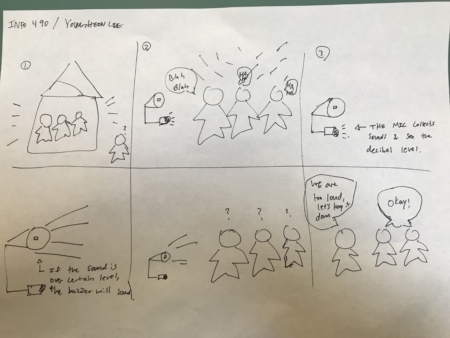 This is my Storyboard with people in the house being loud and passengers being disrupted by them. However, there is a sensor in the house that collects sounds and gives out buzz sound when the sound level is too high. So, the buzzer goes and people in the house starts to quiet down. This is picture of the tested version with the light, as you can see, there is the mic sensor on the top right corner of the picture and led light on high. This is a really bad photo, but the this on the right is my buzzer and this is the final Arduino model for my assignment. I wasn’t quite sure the buzzer was working as I wished and couldn’t test properly since the environment I work at was quite loud. Later on when I have time, I hope to work with Arduino in depth and test out various products. 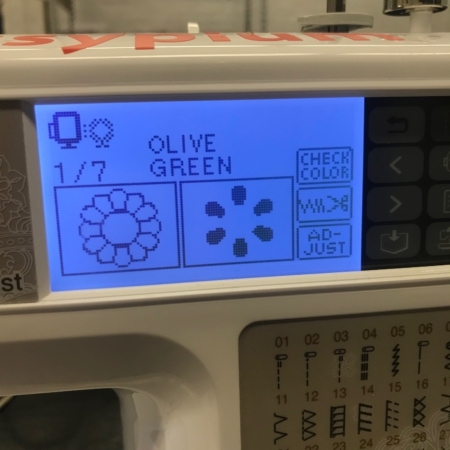 For the textile assignment, I started out by trying the automated embroidery machine for the first time. To get used to the machine, we made a small string bag during class time. 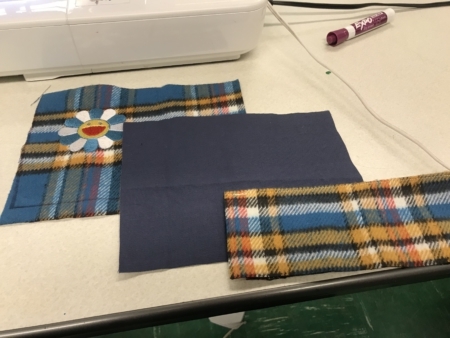 I chose my fabric and followed the steps given by Duncan. The steps were easy but the machine was more difficult than expected. The lines weren’t straight and I even sew the wrong parts so, I had to go back and re-do the steps. The bag came out better than I expected and I actually used it to put my perfumes in during spring break. 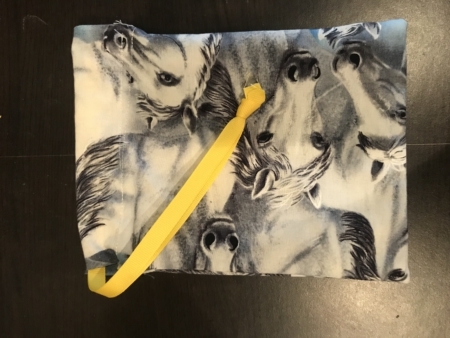 This is my pouch I made during class, I only put on handle since it was much more comfortable using it. 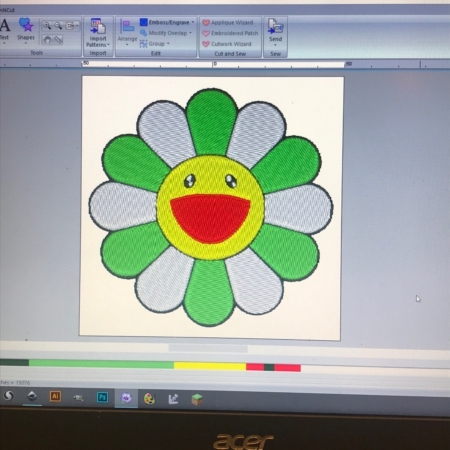 One week later, we made a patch during class with the embroidery machine. 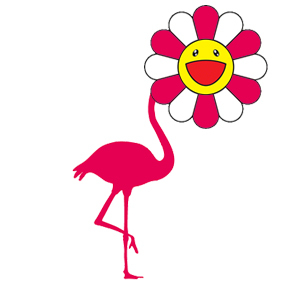 I once again used the Murakami flower as my model. The separating process was easy since it was already color blocked. I just got rid of the grey and black layer that was unnecessary and everything was good. I used the chain stitch method for the outer border to make it more firm and used green and white to color the panels. I am really satisfied with what I got. This is what it looked like when I moved it to the sewing machine to do the embroidery. 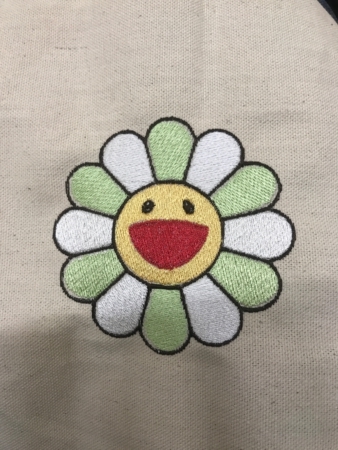 This is my final patch made in class, I really like how the colors turned out. Also I used chain stitching for the black part so it would give a more stable finish. 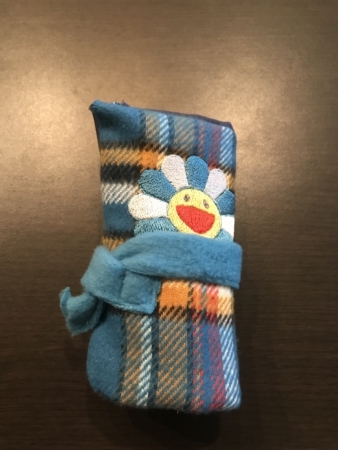 For my final project, I decided to make a rolling pencil case. I have modified the measurements so I can put bigger things than a pencil such as perfumes when I travel. I got the idea and learned the basic steps from youtube. I started by choosing fabrics for my piece. I first chose a very thin piece so I can sew on my embroidery. 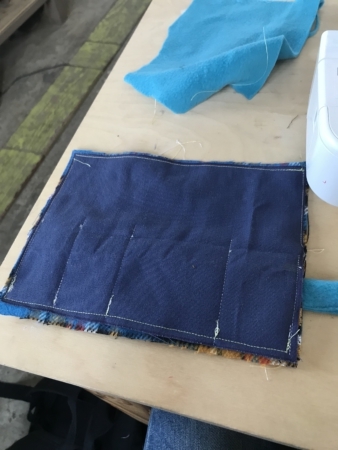 However, since the fabric was too thin, even with the stabilizer, the sewing machine kept on getting clogged up and it was impossible to progress. So, I changed my fabric to a fleece-like fabric that had some thickness to it. Everything went well after I changed the fabric and embroidery was done without any problem. 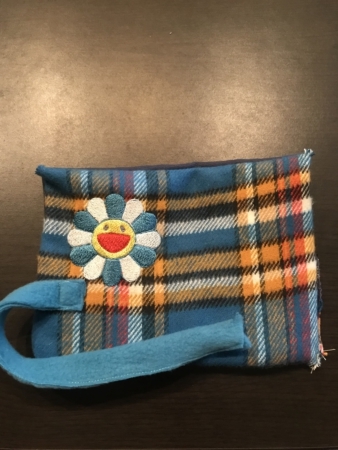 After that, I followed the steps shown in the youtube video, cut out the fabrics, sew on the pockets, sew on the handle and finally sew the whole thing inside out to finish it. The final sewing part before I turned it inside out was troublesome since I didn’t really know how much of a space I needed in order for me to turn it inside out. As a result, I actually left much more than I needed and had to sew that part again. Through the troubles and some difficulties, I finished my project. The end product is what I expected and it fits my perfumes perfectly! I’m very excited to use this in the future especially when I travel. This is after I cut out all the fabric that I will use for my final product. This is what it looked like before I turned it inside out. 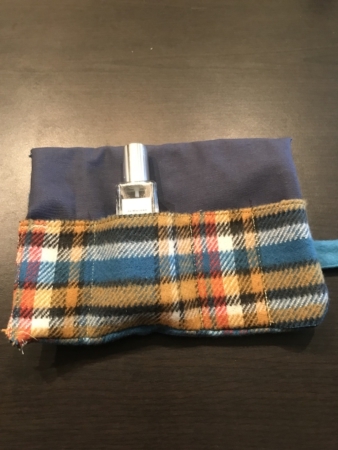 These are pictures of my end product with the perfume put into place, the general look of the outside and how it looks when I roll up the case. For the last 2 weeks, I got a chance to work with 3D printing. From designing and scanning to even printing my own creation. 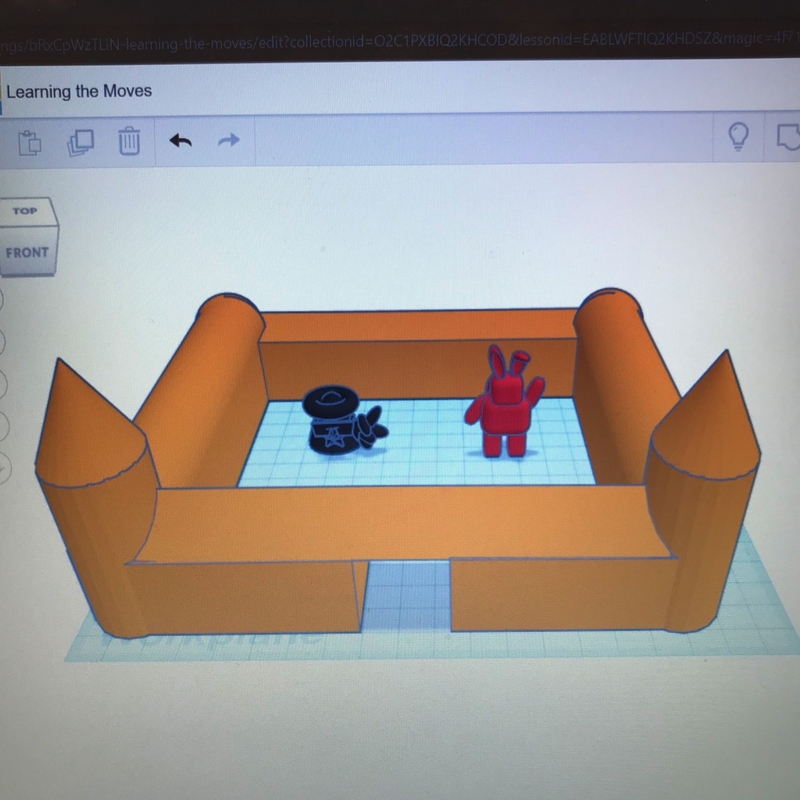 To start to get familiar with the program, I got access to TinkerCAD and made a castle. It was easy and fun playing around with shapes to create my own castle. Then I made on to put some aliens in the castle with the basic shapes and other shapes such as sunglasses, peace sign and bunny ears. 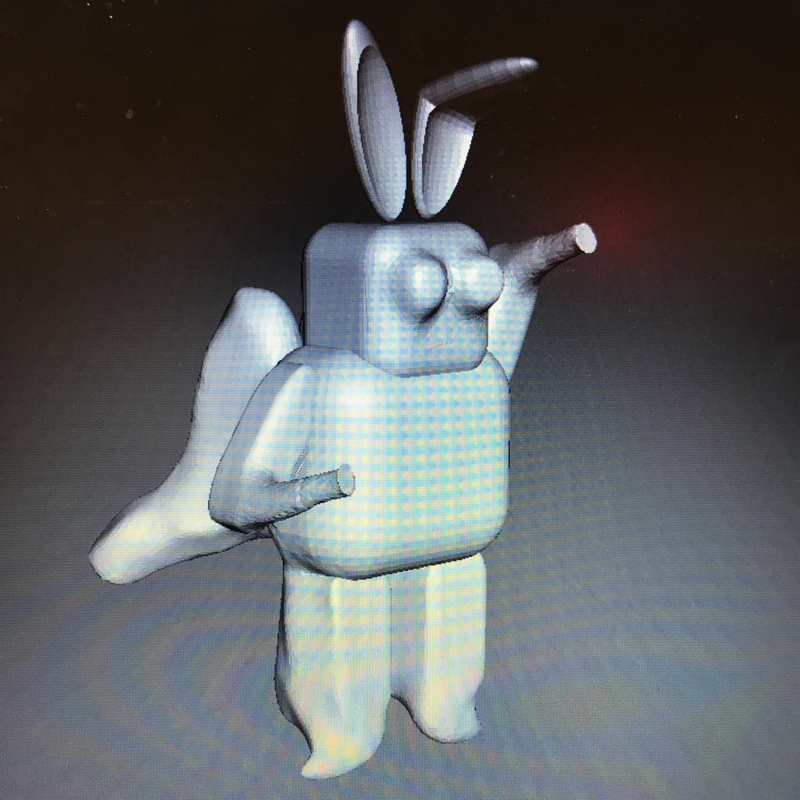 I even took one of the aliens to meshmixer to play around and make it more like an alien. The pictures on the bottom are my castle and aliens. This is my castle and two aliens I made! For my second prompt, I decided to choose an art piece and combine it with myself! 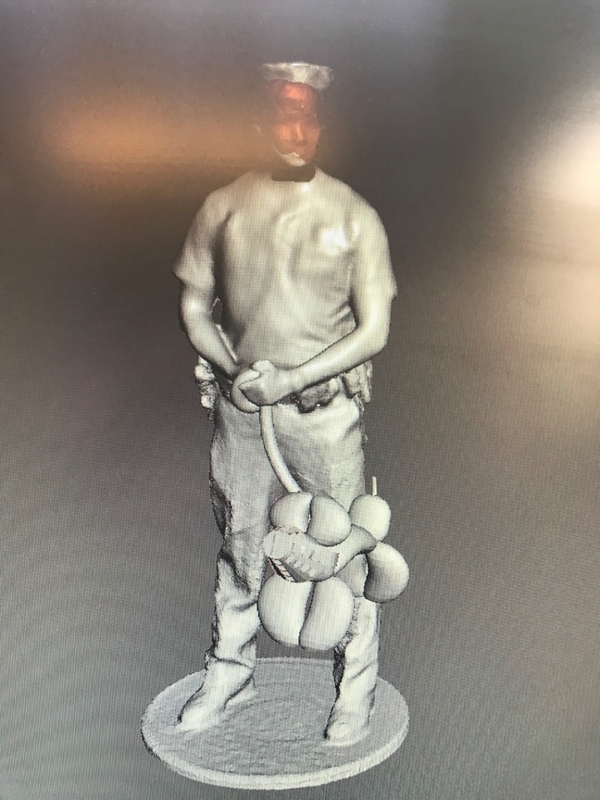 I started this by scanning myself in 3D from a help from my friend. I only need my torso and face, so the scanning process was easily done through Ipad scanning. I, then, started to search for famous sculptor or painting that is modeled in 3D. As a big fan of Banksy, I started my search from there. Banksy is famous graffiti artist who is known for criticizing the modern society with fun twist to an existing objects or people. Most famous art piece would be the ‘girl with ballon’ and ‘flower thrower’. 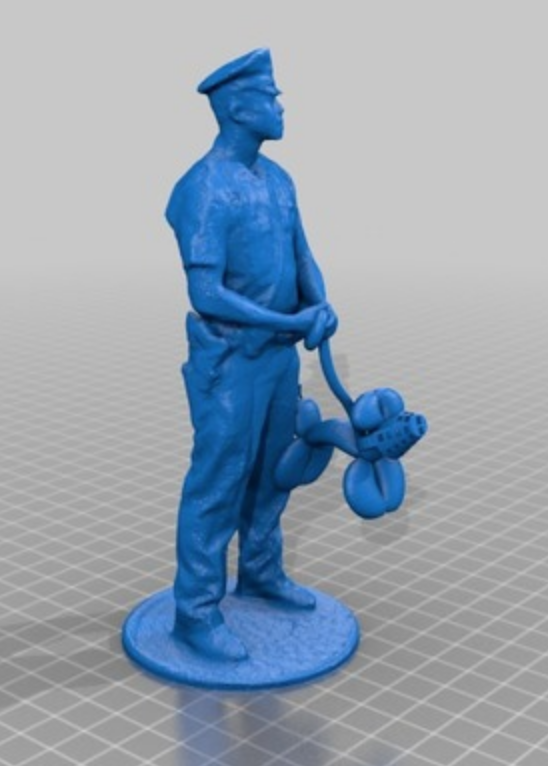 I found a 3D modeled piece of Banksy’s art named ‘policeman and ballon dog’. 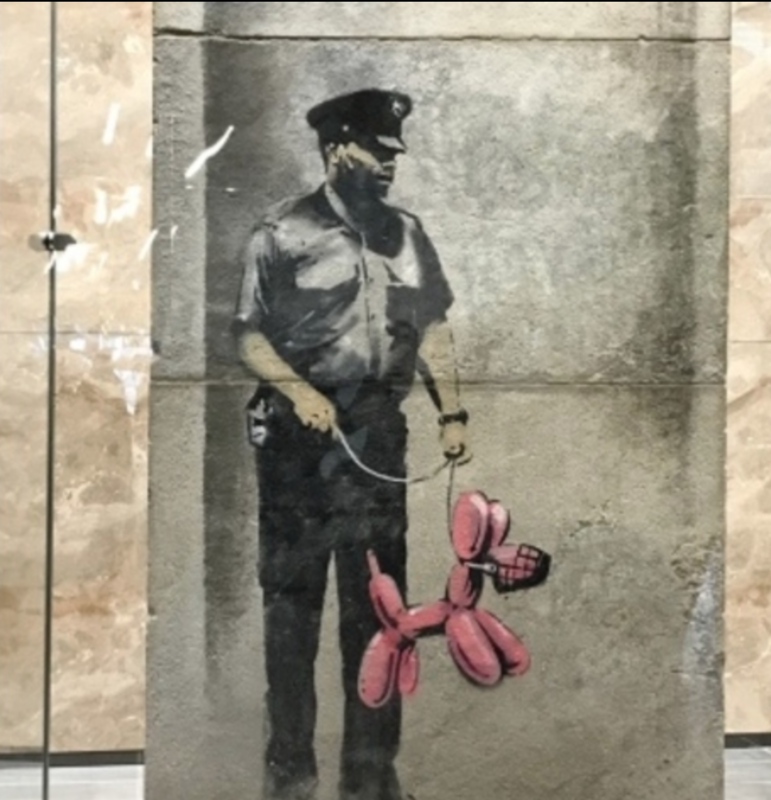 This is originally a wall paint and tried to mock the police by changing the K9 dog into a balloon dog. 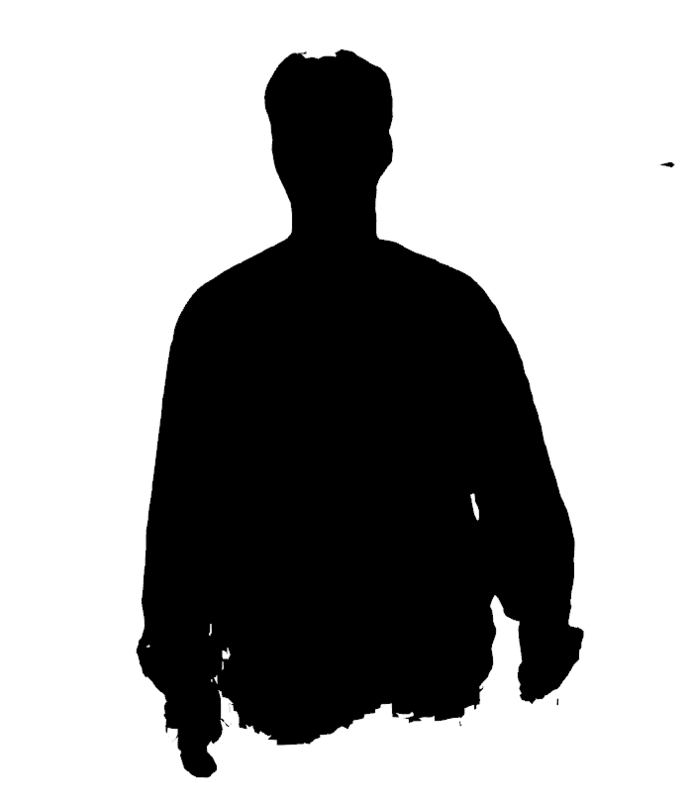 This is me scanned, I have no idea why it’s just black but you can see the general shape. Then I moved scanned myself and policeman to the Meshmixer to mix! 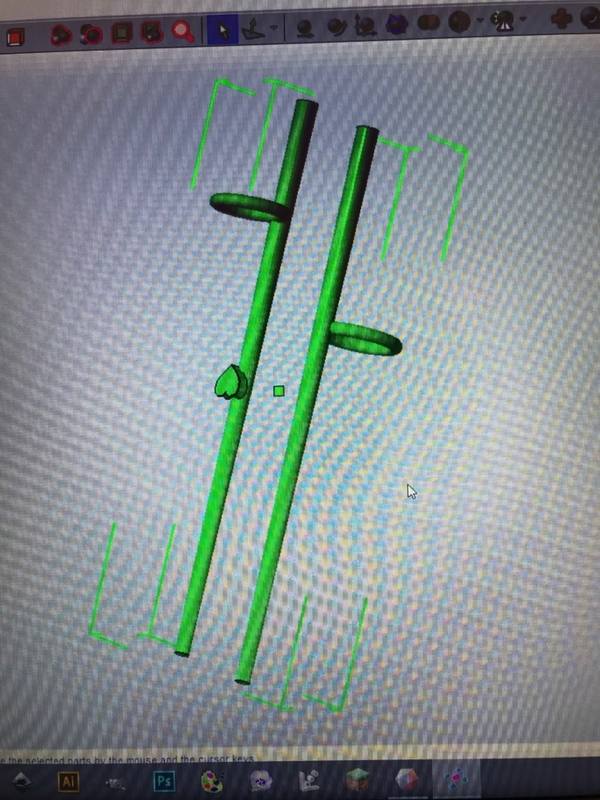 When I first imported the files, unknown error occurred and it didn’t let me mix the two. However, I re-opened the files and finally I could mix it. I didn’t really have much knowledge on Meshmixer so, I started out by transforming myself and combined it with the police. The process took a long time since I was a beginner with Meshmixer. I finally got a right mix and I did some editing. 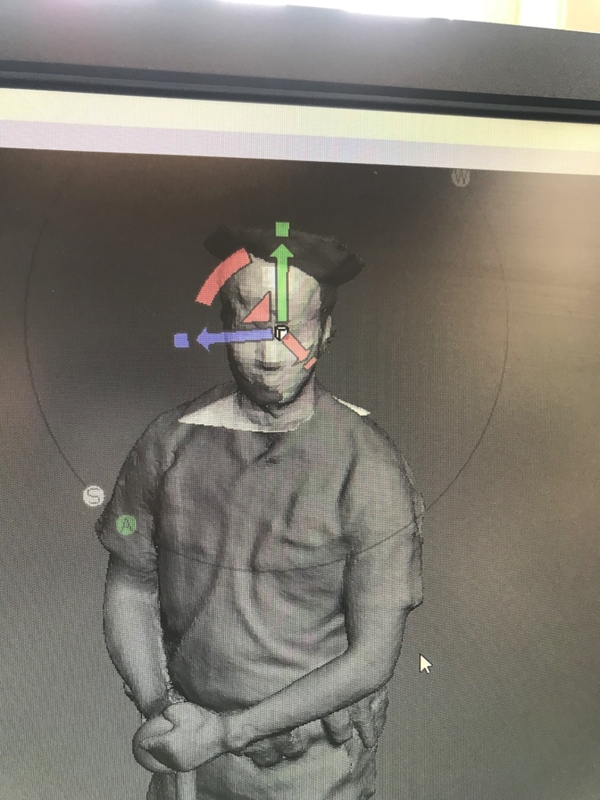 I flattened out all the neck part that was sticking out and I flattened the police uniform so I could make it similar to what I was wearing while being 3D scanned. Even though my face isn’t really recognizable, I’m still satisfied with the results. The results are shown below. This is the end product. The top of my head and the hat is actually natural when you see it from meshmixer. Sorry for the blurry picture. 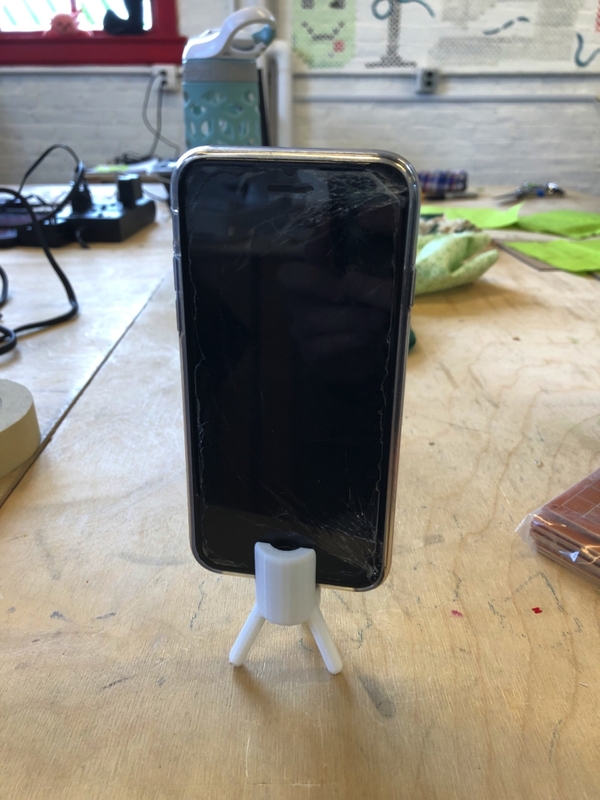 Finally, I chose to make and print a Iphone stand that allows me to charge while standing up. Since most of my friends are in Korea, I face-time them a lot and the battery runs too quickly that I have to constantly charge my phone. When charging, it’s a hassle to place my phone without the cords getting tangled. So, I decided to make an iphone stand with a hole under it for the charger to go through. 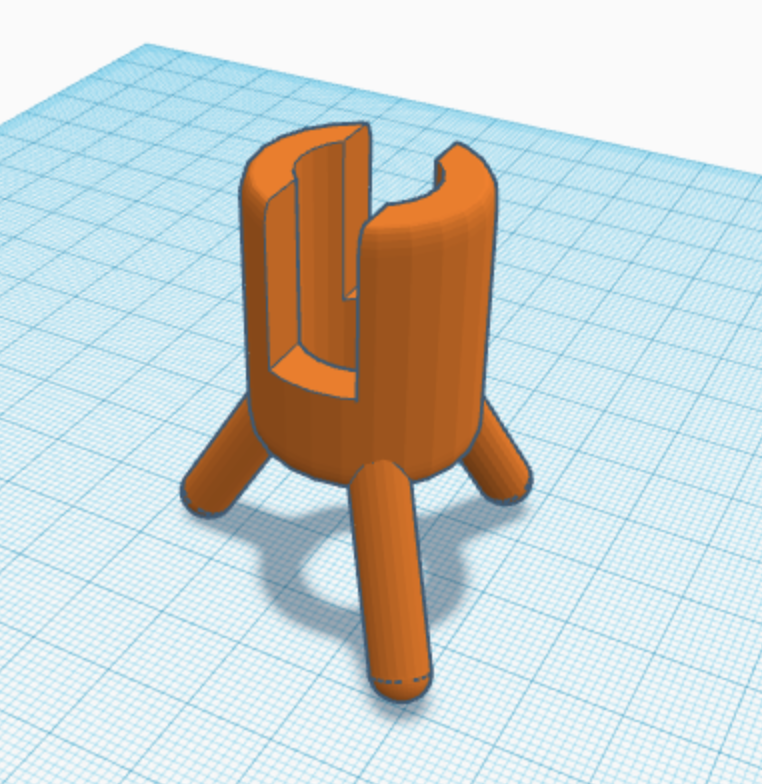 I started the sketch on paper and quickly moved on the TinkerCAD to make it. I also, have to search up the dimensions of iphone to make sure I get the right height and radius of the hole. I started by making the legs then moved onto make the body. I added on a longer leg to make the stand more stable. The body is made with a deep enough hole to keep an iphone in place without the stand falling back. 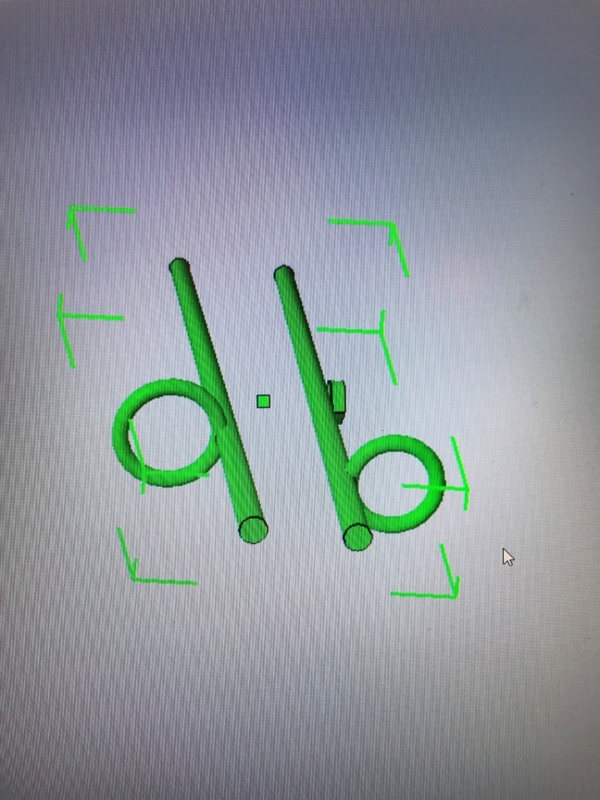 After I designed the product on TinkerCAD, I went on to print it. The supports were created by auto-support and I did a 15% fill-in because I didn’t want to take too much time on printing. 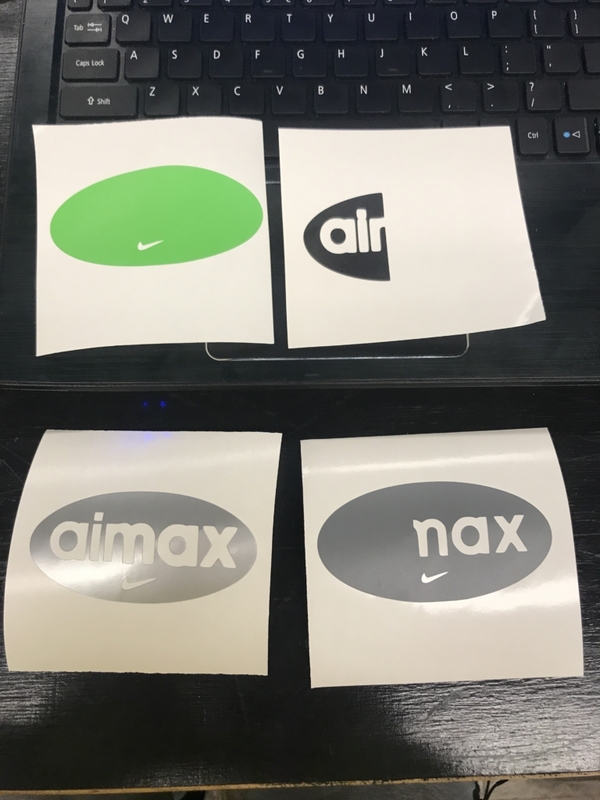 The design was already measured to scale so, no modification was needed before printing. 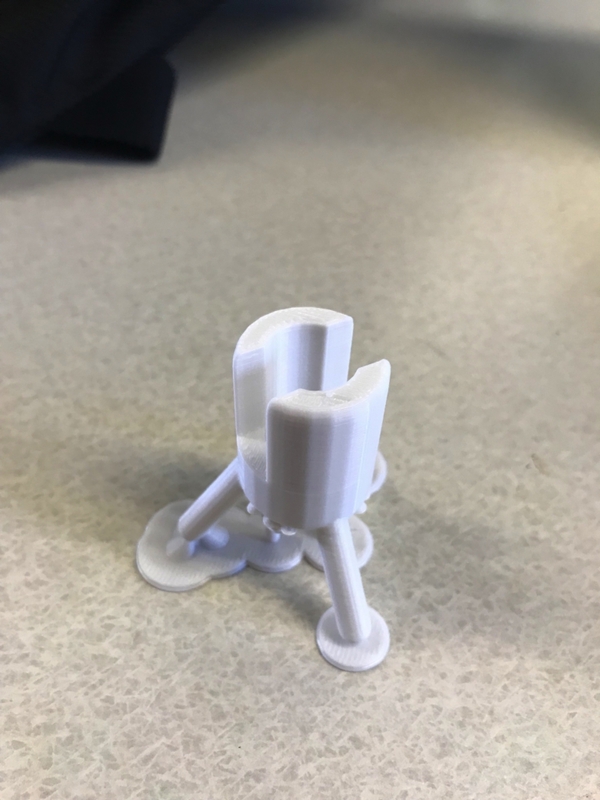 This is my phone stand printing! 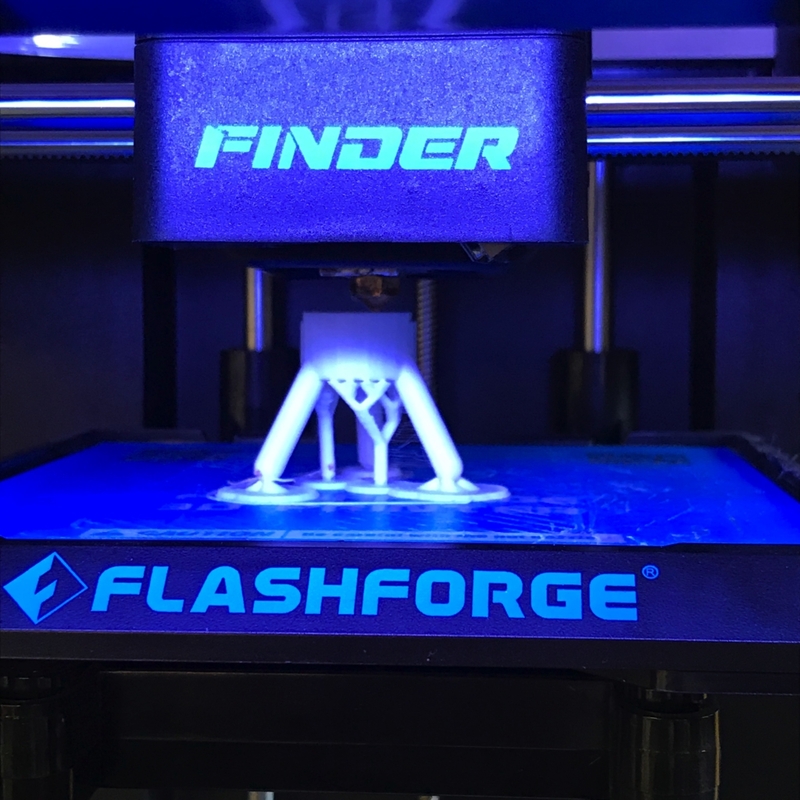 After 54 minutes, I got my first 3D printing done!!!! I carefully took off the supports and put my phone in it to see if the measurements were right. My phone fitted perfectly and I’m really excited to used it for myself. 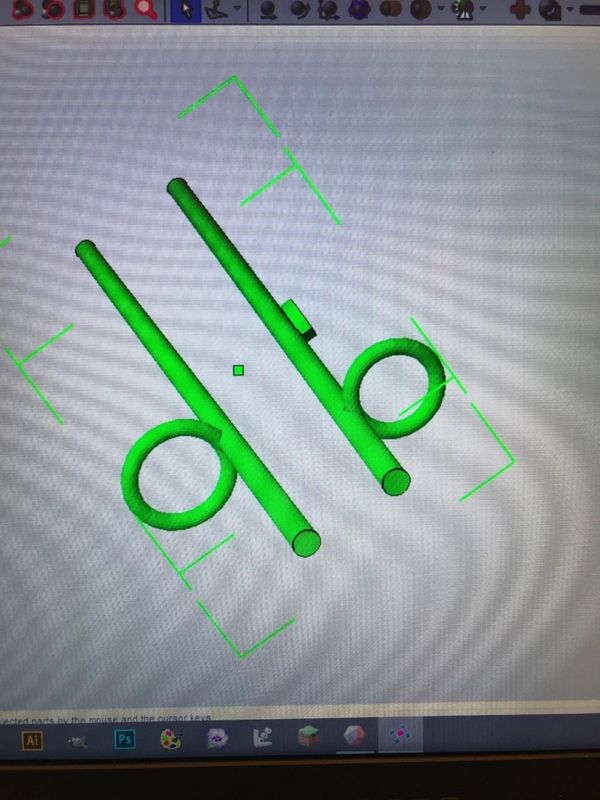 All throughout the process, I didn’t have much problem but if I were to print again, I will try to make the legs a little longer so I have more room for the charger. Still, I’m really satisfied with what I got and really want to print more things in the future. This is my little stand holding up my Iphone!! I will take it home and use it right away! 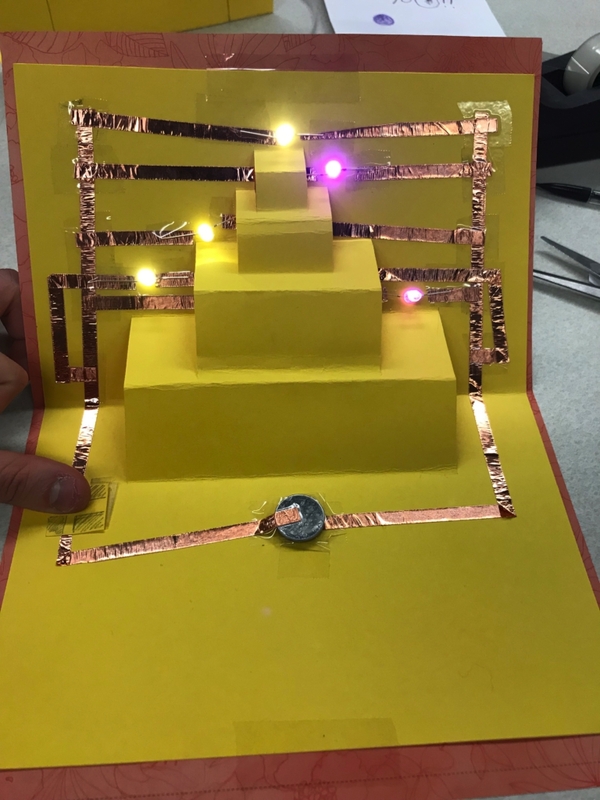 For this week’s assignment, I got a chance to work with paper circuits and create a pop-up card. Beginning of the lab section, I created a basic circuit to see how copper tapes, batteries and light bulbs work. 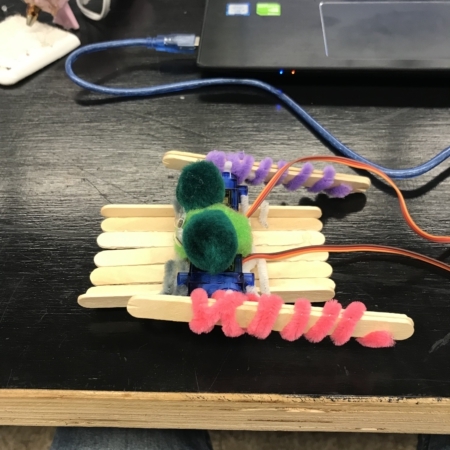 Distinguishing + and – sign on the light bulbs, creating a gap in between to make a ‘switch’, learning the basics about resistors and when to use them were all very crucial in success of my project. 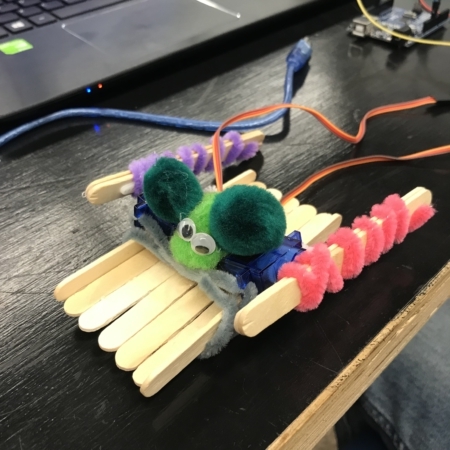 After I was done with my first circuit, I got a chance to actually play with multiple light bulbs and work on my parallel circuit. I didn’t really wanted to use resistors since it will make the circuit too complicated. So, I chose warm white light and pink light, which has similar resistor value and created a parallel circuit as shown in the pictures below. I chose a quote and created a little quote paper that folds. I didn’t really have much time in class and copper tape was actually really hard to fold and stick as I wish so, the quality is not quite where I wanted it to be. This is the multiple light bulb circuit that I created during class time. 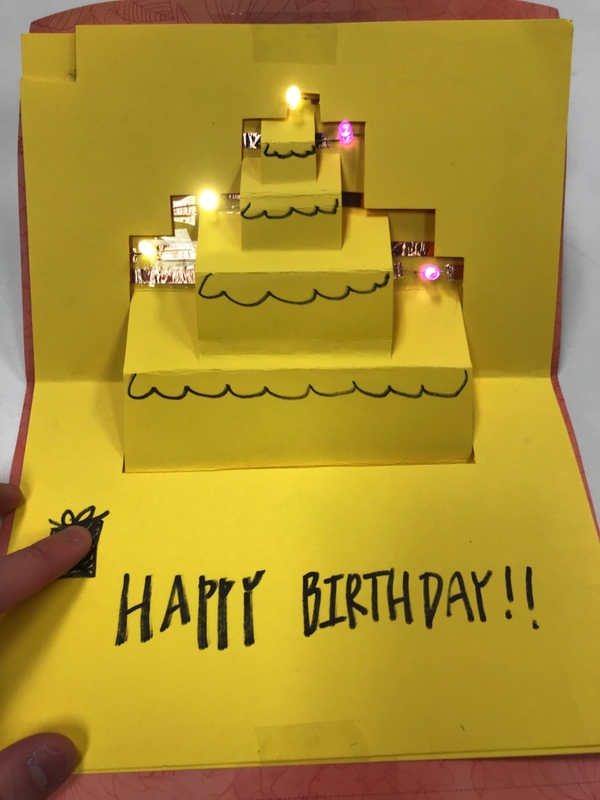 For my final project, I got a chance to make a pop-up card. I never had a chance to create a pop-up card in my life so, I was a little scared of the project when I first heard it. I started by going on Youtube to see some videos about the basic pop-up cards and ran into a birthday card. Thinking I could use lights as candles on the birthday card, I started to design the card and think about the copper tape lines. 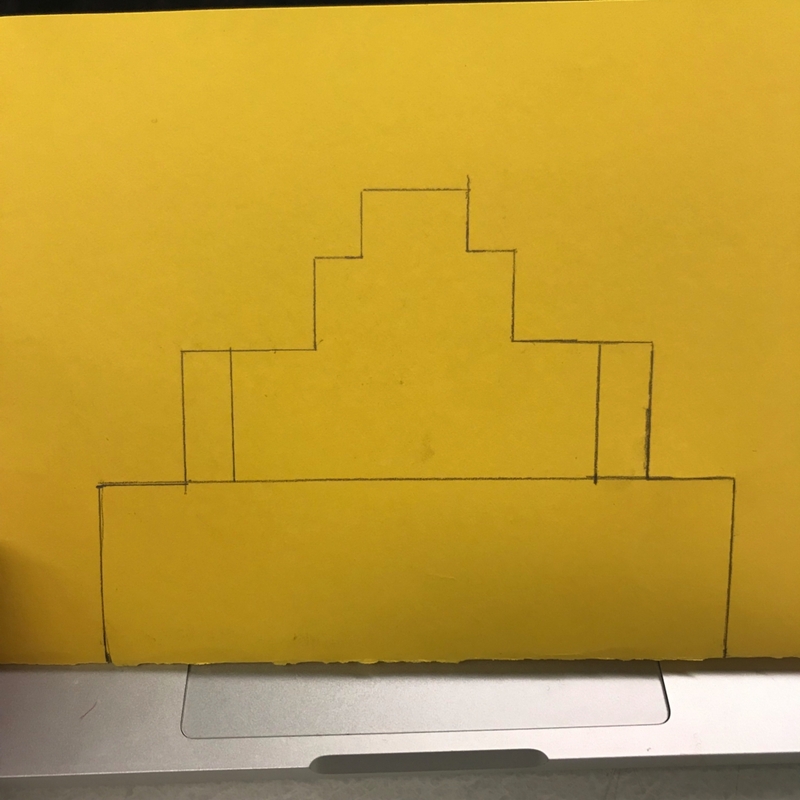 I first drew the sketch to cut the pop-up card and actually cut it to see if it worked. It wasn’t perfect since I used a thick paper compared to the Youtube video but I was satisfied. Then I started to make a parallel circuit that goes around the cake. The top candle was easy to make but starting at the second candle, I had to go behind the card to make the copper tape go through. After the first attempt, I got a feel of it and the rest was easy. I once again made use of warm white lights and pink lights to make up the candles. 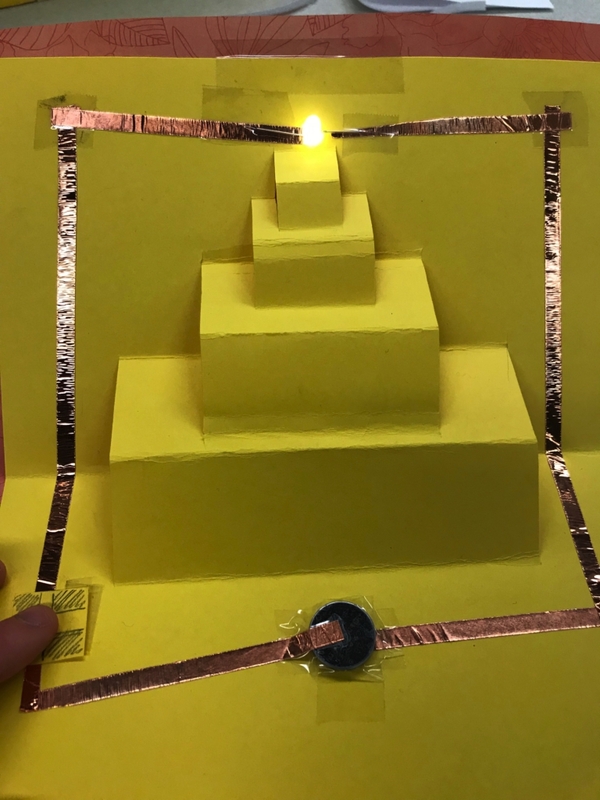 I created a parallel circuit and also utilized invisible tapes to overlap my copper tape circuits without creating any trouble. After I was done with the line, I got a new paper and cut out the cake again to cover up the copper line and write a message. The process pictures and final product picture is down below. 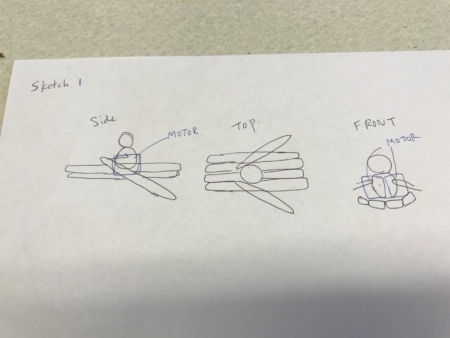 This is the basic sketch of my pop-up card. I didn’t draw the copper tape line because I was going to follow up the lines on the cake. This is the pop-up cake after the installment of first ‘candle’. The gift on the left is the switch that I made. This is the final copper tape outline of my pop-up cake. 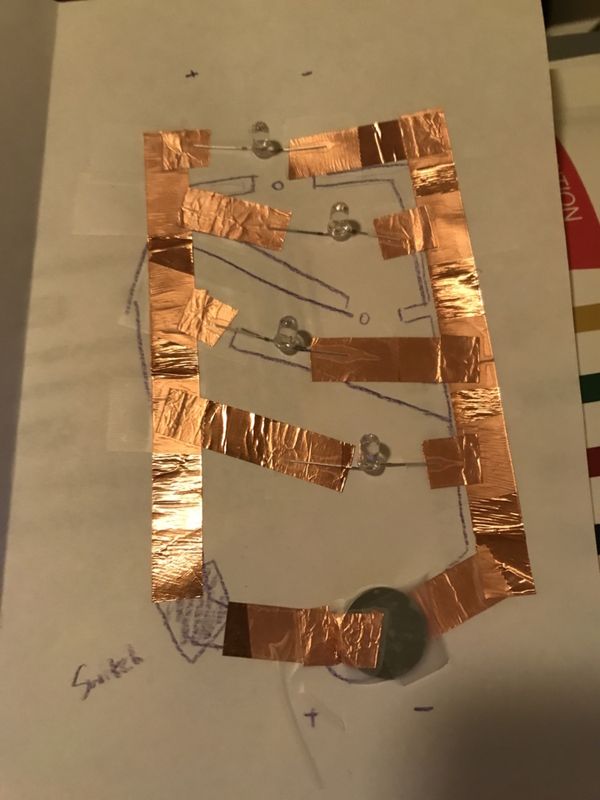 The copper tapes has been connect through the back of the pop-up parts and also, there is part where the copper tapes seem to overlap but I covered it with invisible tape so it won’t cause any problem. This is my final product, I couldn’t poke a hole for each candle since the paper was too thick so I just cut out the minimal amount to show the lights. I re-created a gift button that acts as a switch. So, the project overall was very interesting and I had very much fun working with copper tape circuits. I feel like I learned a lot of basic formula for the circuit and I’m glad. I was never too friendly with science but at least I can now create circuits! One thing I really regret is having more time to actually study the resistor values and make use of various colors of lights. As you can see, I could only make use of warm white lights and pink lights which have similar value of resistors. Maybe next time, I can actually do some more experimenting and have some more time to give a better finishing details to my card. 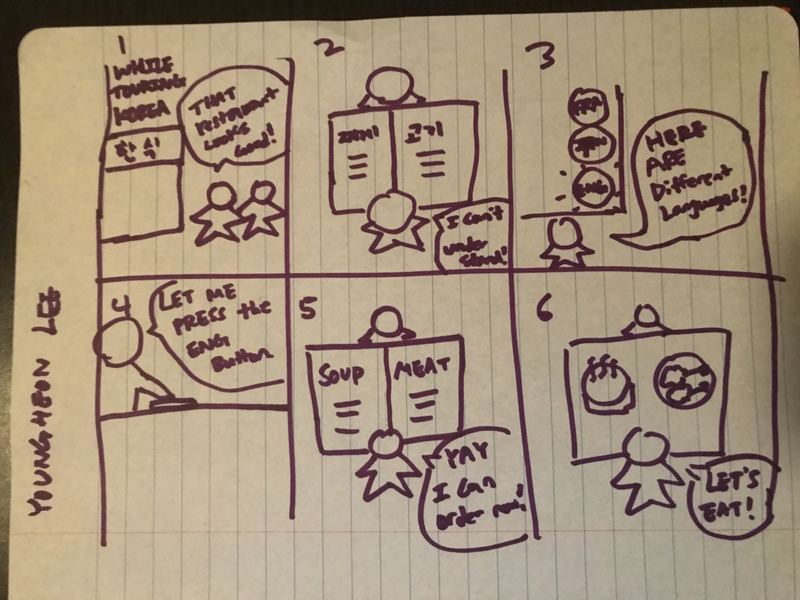 Storyboard is one way to illustrate and communicate my ideas. For the storyboard to be effective, there has to be 3 components: setting, sequence and satisfaction. Setting is the environment and people, sequence is the problem or condition that people are facing and the satisfaction is how my idea completes the need of the people. Amongst the choices, I chose to develop the tablet tables on the restaurant. I have been a fan of traveling and most of the restaurants that I have been to in foreign countries didn’t offer a translated menu. So, my storyboard start with Americans (english-users) traveling in Korea. They find a restaurant to eat but can’t read the menu since it’s in Korean. The tablet table has a english button on the side and by pressing it, the menu automatically translates into English. With the new menu, the travelers can now order and enjoy their food. 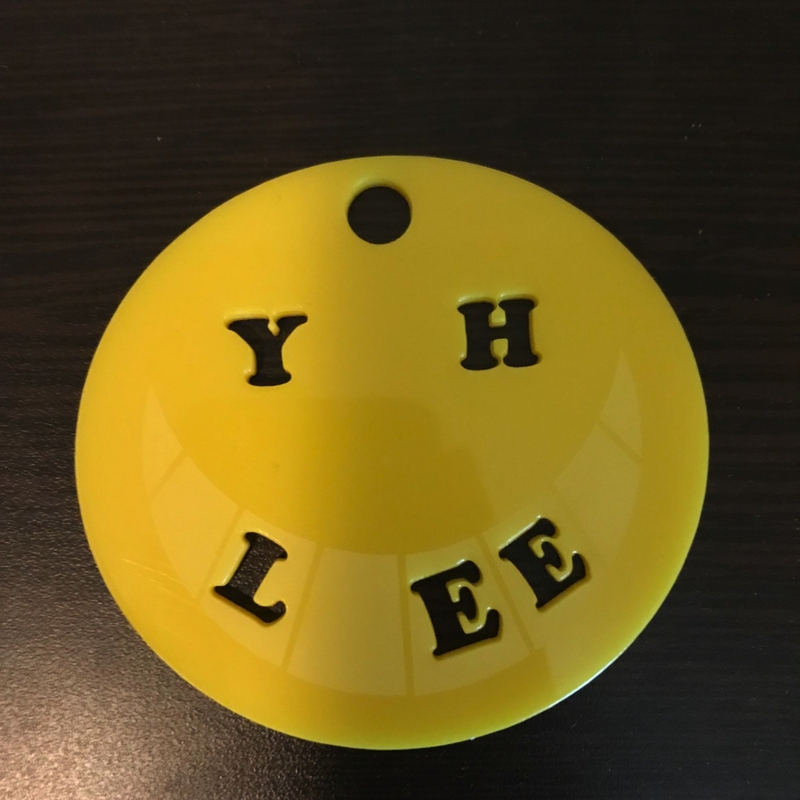 Planning: My name is Youngheon Lee but due to the difficulty in pronouncing my name, I usually go by YH. Most people that know me call me YH so, I decided to put that on my name tag. Since my name got so much shorter, I wanted to take advantage and incorporate that into the design of the name tag. 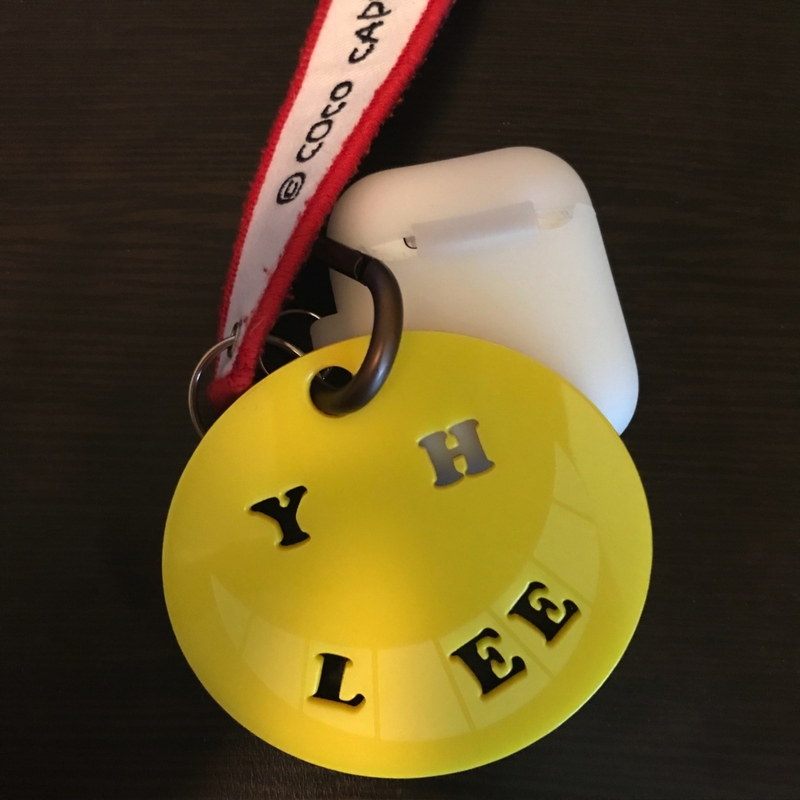 Unlike usual name tag, I actually wanted to use whatever I make from this session so I decided to make a name tag that will serve as an accessory for my airpod. 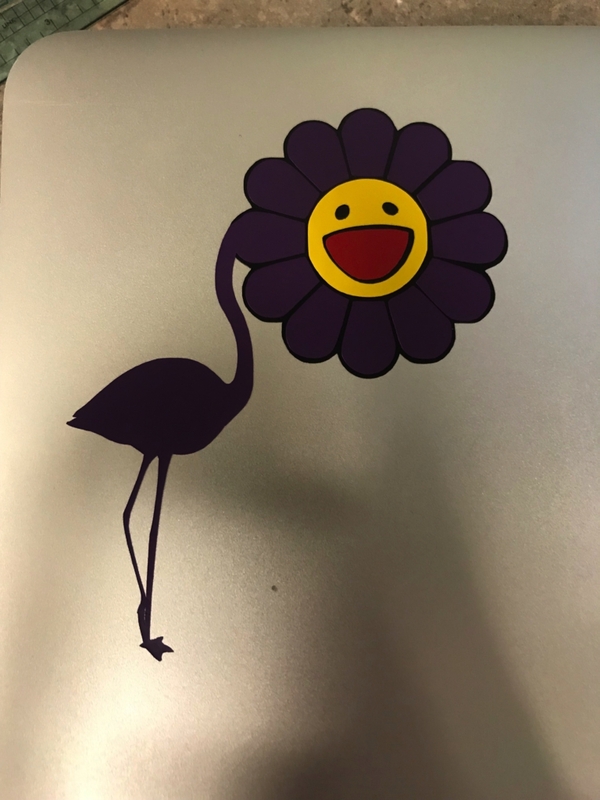 I searched up key chains to get some idea and finally settled upon the classic smiley face. Since I was going to use YH as my name, I switched the eyes with Y and H. Initially I wanted to keep the smiling mouth as the original form, but Y and H made it to vague to be a ‘name tag’, so I decided to put my last name (LEE) on the teeth of the smiling face to make it more unique. This is what is looks like on my airpod key ring. 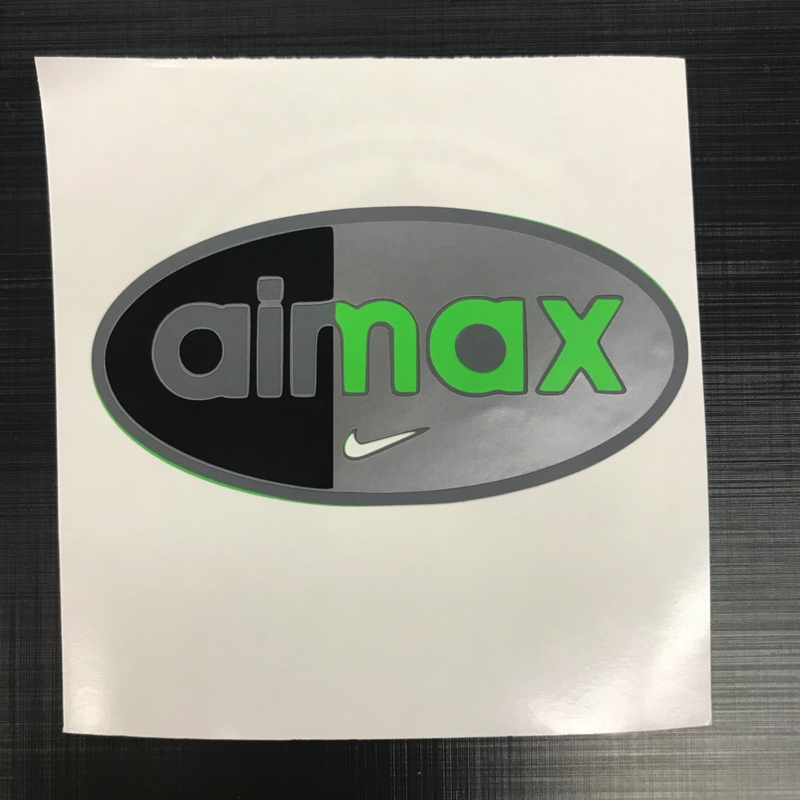 Final thoughts: The final product came out as expected. I do want to try changing the shade or the material in the future to bring out even more variety. 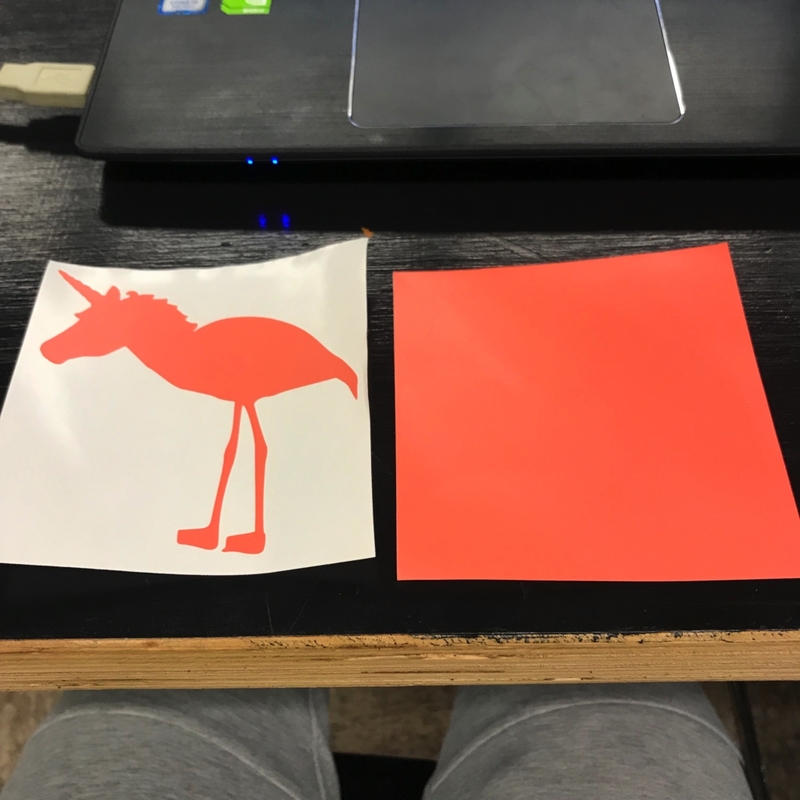 The designing and cutting process all came along smoothly and I am glad I got a chance to work with Inkscape and laser cutter. 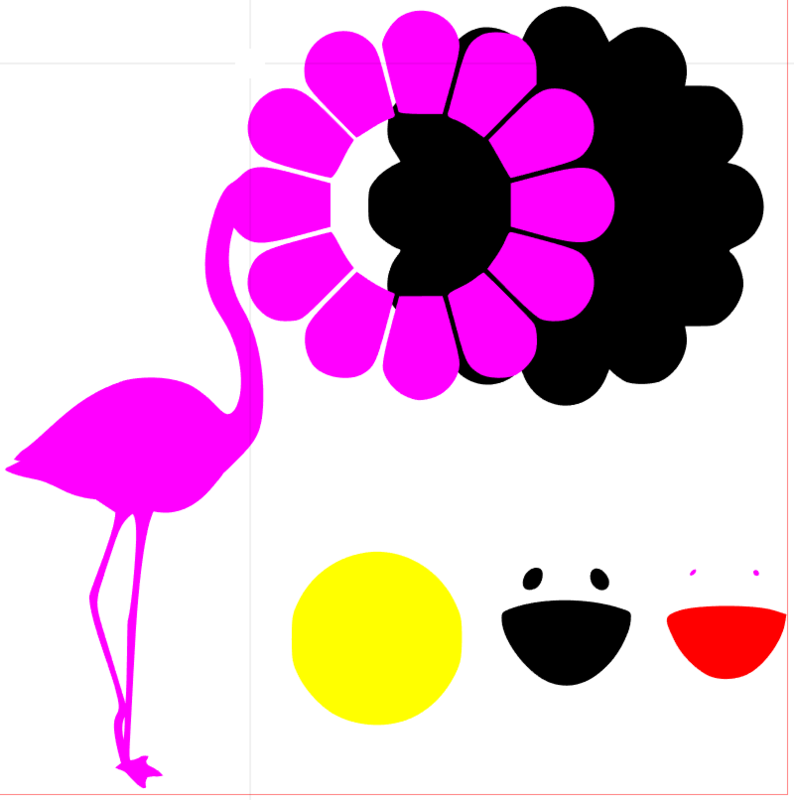 Especially Inkscape came in handy because I was only used to photoshop but Inkscape had features much simpler but beneficial compared to photoshop (when compared to normal function that I use on photoshop). The whole process so fun since I love making logos and actually bringing them to life. I do look forward to making more of anything in the Fablab.